Last edited by bystander on Mon Nov 20, 2017 8:27 pm, edited 1 time in total. <<In Arthur C. Clarke's Space Odyssey, monoliths are machines built by an unseen extraterrestrial species. All the monoliths are black, extremely flat, non-reflective rectangular solids whose dimensions are in the precise ratio of 1 : 4 : 9. The monoliths come in several different sizes: TMA-0 and TMA-1 are both about 11 feet long and TMA-2 is two kilometres long on its longest axis, whereas the monolith on Europa is considerably larger. While it is unclear what the composition of the monoliths is, they clearly have mass, which is about the only observation that can be made. In the novel 2010, the crewmen of the spaceship Alexei Leonov measure the mass of TMA-2 and they find that it has a density slightly higher than that of air. 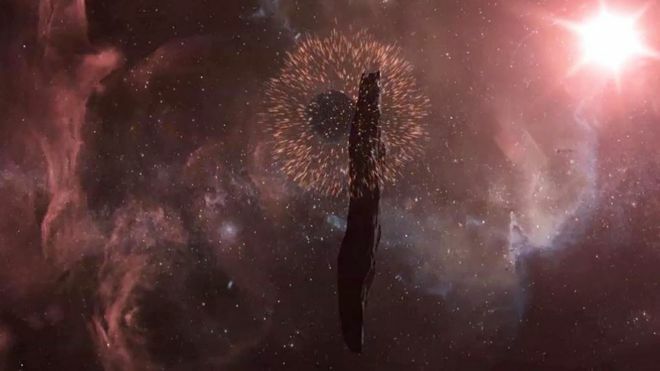 The extraterrestrial species that built the monoliths is never described in much detail, but some knowledge of its existence is given to Dave Bowman after he is transported by the stargate to the "cosmic zoo", as detailed in the novels 2001: A Space Odyssey and 2010: Odyssey Two. The existence of this species is only hypothesized by the rest of humanity, but it is obvious because the monolith was immediately identified as an artifact of non-human origin. This is an astonishing shape, to say the least. Sure wish it had been detected sooner, so that we'd have more than just an artistic guess as to its appearance. Two conjectures come to mind: (1) It is a shard or chip off some larger body. (2) It is a humongous crystal. BDanielMayfield wrote: This is an astonishing shape, to say the least. Sure wish it had been detected sooner, so that we'd have more than just an artistic guess as to its appearance. Consider also that the model could be wrong. Reconstructing the shape of a body from just its temporal reflection profile is generally impossible. There is no closed solution. So what you actually get is a probabilistic reconstruction. Yes, there's a good chance that the conclusion is close to reality, but it isn't certain. BURKE: Nice room. I’m Burke. Carter Burke. I work for the company, but other than that I’m an okay guy. Glad to see you’re feeling better. I’m told the weakness and disorientation should pass soon. Side effects of the unusually long hypersleep, or something like that. RIPLEY: How long was I out there? They won’t tell me anything. 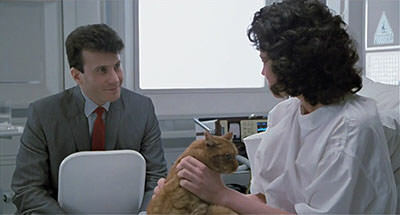 BURKE: Well, maybe you shouldn’t worry about that just yet. BURKE: All right. My instinct says you’re strong enough to handle this … Fifty-seven years. BURKE: You’d drifted right through the core systems. It’s blind luck that deep-salvage team caught you when they … Are you all right? It does seem extraordinary that such a rare object would also have such an extreme shape. I'm no ufo fan, which is why my mind seeks natural explainations for this somewhat unnatural looking shape. We report on g, r and i band observations of the Interstellar Object 'Oumuamua (1I) taken on 2017 October 29 from 04:28 to 08:40 UTC by the Apache Point Observatory (APO) 3.5m telescope's ARCTIC camera. We find that 1I's colors are g−r=0.41±0.24 and r−i=0.23±0.25, consistent with the visible spectra of Masiero (2017), Ye et al. (2017) and Fitzsimmons et al. (2017), and most comparable to the population of Solar System C/D asteroids, Trojans, or comets. We find no evidence of any cometary activity at a heliocentric distance of 1.46 au, approximately 1.5 months after 1I's closest approach distance to the Sun. Significant brightness variability was seen in the r observations, with the object becoming notably brighter towards the end of the run. By combining our APO photometric time series data with the Discovery Channel Telescope (DCT) data of Knight et al. (2017), taken 20 h later on 2017 October 30, we construct an almost complete light curve with a most probable lightcurve period of P≃4 h. Our results imply a double peaked rotation period of 8.1 ± 0.02 h, with a peak-to-peak amplitude of 1.5 - 2.1 mags. Assuming that 1I's shape can be approximated by an ellipsoid, the amplitude constraint implies that 1I has an axial ratio of 3.5 to 10.3, which is strikingly elongated. Assuming that 1I is rotating above its critical break up limit, our results are compatible with 1I having having modest cohesive strength and may have obtained its elongated shape during a tidal disruption event before being ejected from its home system. Astrometry useful for constraining 1I's orbit was also obtained and published in Weaver et al. (2017). What exactly does "an axial ratio of 3.5 to 10.3" mean? Is this a range of possibility from 1:3.5 to 1:10.3, or is this a width to length ratio of 3.5:10.3, which would only be about 1:2.94? BDanielMayfield wrote: What exactly does "an axial ratio of 3.5 to 10.3" mean? Is this a range of possibility from 1:3.5 to 1:10.3, or is this a width to length ratio of 3.5:10.3, which would only be about 1:2.94? Asteroid shape is commonly simplified to three axial measurements, and the ratio between them (x:y:z). I think in this case they're treating two of those as the same, so basically, this is what we might think of as the length to width ratio for something that is a symmetrical prolate solid. The range given means that this body may be no more elongated than many asteroids we have already observed in our system, or it may be more elongated than anything we've seen before. Big error bars. Thanks Chris. Then another way to state its shape would be 1:6.9+/-3.4, and about 7 to 1 would be a more probable guess as to its real length. It was also very interesting to read the theory of how 1I likely got its shape as it was ejected our way. It made me think of silly putty. Instead of being a rigid solid, it was likely stretched into its shape as it passed close to an inner stellar system planet. Totally expected result, but still well worth a listen. Just watched the above NASA video and noticed the scientist saying there are no other known asteroids shaped like this in the Solar System. Given that there's been over 100,000 asteroids observed (https://en.wikipedia.org/wiki/Asteroid# ... ed_methods) and assuming many have had their shapes estimated, that would mean there is something very special about this object. Does anyone know the true number of shape estimated asteroids? daddyo wrote: Just watched the above NASA video and noticed the scientist saying there are no other known asteroids shaped like this in the Solar System. Given that there's been over 100,000 asteroids observed (https://en.wikipedia.org/wiki/Asteroid# ... ed_methods) and assuming many have had their shapes estimated, that would mean there is something very special about this object. Keep in mind that the aspect ratio seen here is very speculative. The actual value is probably less, as low as 1:3 (or even a bit less than that), which makes it consistent with a large number of asteroids. A study of the asteroid’s photometry, led by Michele Bannister (Queen’s University Belfast, UK), used the Gemini-North telescope in Hawaii and the William Herschel Telescope in Spain to explore the asteroid’s shape and color. Bannister and collaborators refined the estimate of the asteroid’s shape to be at least 5.3 times as long as it is wide, which requires this body to have significant internal cohesion to hold together as it tumbles. Their measured color for ‘Oumuamua is largely neutral. Therefore the weirdness of its shape has apparently been confirmed. 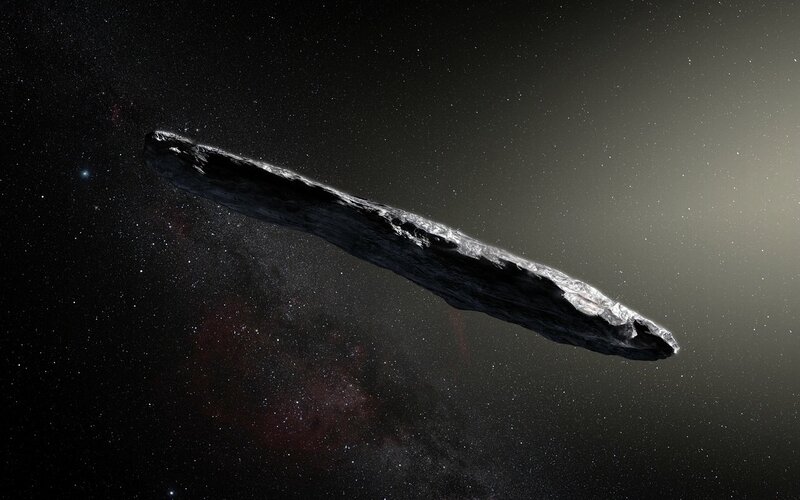 Gregory Laughlin of Yale University and Konstantin Batygin of Caltech (and Planet Nine fame) explore some of the consequences of ‘Oumuamua’s parameters. They argue that its current passage, if it’s not a fluke, suggests the presence of an enormous number (1027) of such objects in our galaxy alone — enough to account for two Earth-masses of material for every star in the galaxy. Flinging asteroids like ‘Oumuamua out into interstellar space isn’t easy, though; the necessary multi-body interaction requires the system to contain a giant and long-period planet like our Neptune or Jupiter. Taken together, this information suggests that every star in the galaxy may host a Neptune-like planet at a Neptune-like distance. They argue that its current passage, if it’s not a fluke, suggests the presence of an enormous number (1027) of such objects in our galaxy alone — enough to account for two Earth-masses of material for every star in the galaxy. That's actually quite a bit less than I expected, and I think a lot less than some recent studies have predicted, where virtually every star is assumed to have planets, and virtually every star may have ejected 10 times or more the number of planets they eventually retained. That is the conclusion of new Belfast research that has examined in detail the light bouncing off the cigar-shaped asteroid from outside our Solar System. "At some point or another it's been in a collision," says Dr Wes Fraser from Queen's University. His team's latest study is featured in Sunday's Sky At Night episode on the BBC and published in Nature Astronomy. For the new study ... Jackson and his co-authors set about testing how efficient binary star systems are at ejecting objects. They also looked at how common these star systems are in the galaxy.